We have a certain way of doing things including our critical standards of care that we stick to in order to ensure you receive the best possible outcome with your treatment. We are dedicated to each patient’s treatment – knowing that everyone’s conditions are unique to them. This also means that treatments are unique to each patient. We work on a patient-by-patient basis so you will never feel like a number. In regards to the length of treatments for specific conditions, every person is going to heal differently than the last. 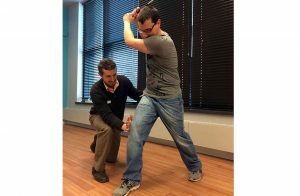 That being said, once we start treatment, it is crucial that patients follow the direction of their physical therapist by coming to all appointments and continuing with their at-home exercises on their own. Not following through, will only prolong the pain and the treatment. At Franklin Rehabilitation, our philosophy is that compliance is a responsibility shared by therapist and patient. The best therapy providers follow quality assurance programs that measure and report the results. Research shows that quality assurance programs combined with patient education increase patient compliance and improve outcomes. At Franklin Rehabilitation, after the initial evaluation, patients receive a detailed explanation summarizing their recommended treatment program. In addition, patients are welcome to explore Franklin Rehabilitation’s online presence filled with free downloadable evidence-based patient guides, frequently asked questions, physical therapy blog and the latest industry news to help them understand the potential benefits of each treatment program to reduce pain, speed up recovery and restore maximum functionality. Although prescriptions are not legally needed to start treatment in a physical therapy clinic, some insurances will require a prescription to pay for physical therapy services. If you have a medical professional (doctor or chiropractor) who referred you to therapy we will communicate with them for collaborative care. If you have another medical professional you would like us to communicate with even though they did not refer you to therapy we would be glad to collaborate with them, as well. Franklin Rehabilitation provides care best suited to each individual patient. Many PT providers set up their practice to minimize costs in response to the continued pressure from insurance companies. One of the most common industry-wide reactions to this pressure is to reduce visit times and pass off patients to whichever therapist is available at that time. Franklin Rehabilitation recognizes this can greatly impact the quality of care and the patient experience, as well as overall length of treatment. At Franklin Rehabilitation, patients don’t need to worry about being passed off to whomever is available on their follow-up visits. Here, you will work with the same therapist team on each visit to ensure proper communication and progression of your treatment. At Franklin Rehabilitation, sitting in a waiting room is viewed as a major inconvenience and is unacceptable to you and to us. Time spent in the reception area should never exceed five minutes, except in rare situations. We understand your time is valuable and we respect that you don’t want to spend more time in a clinic than you need to. Therapists in the state of Wisconsin are required by the state licensing board to meet certain criteria to be eligible for continued licensure. This criterion includes 30 hours of continuing education biannually. If a therapist is scraping by with the bare minimum you might wise to be leary about their commitment to their profession. At Franklin Rehabilitation we require the same 30 hours as the State of Wisconsin, but also require our therapists to participate in monthly continuing education programs which are held in-house. This increases our therapists’ continuing education time to more than 80 hours biannually. Franklin Rehabilitation advocates Direct Access care. In other words, you do not need to see your physician prior to starting therapy. Direct Access leaves the decision up to the patient as to when to seek care if they have a sports-related injury or previously diagnosed muscular-skeletal injury. It also allows the patient to decide which approved provider they choose. Direct Access assures patients can begin care without waiting for a referral, in turn speeding up recovery and pain relief. However, it is our policy to collaborate with a patient’s physician about his or her care. To optimize outcomes, therapists should use the latest evidence-based clinical tools to assess and treat orthopedic, neurological and pain conditions. Believe it or not, many therapists find themselves out of touch with the latest evidence-based treatments. Franklin Rehabilitation is an active participant in the American Physical Therapy Association’s Hooked-On-Evidence program. This assures new research is incorporated as soon as it becomes available.